Stealing music and/or lyrics by downloading them from the internet and incorporating them into new pieces of music: Jack didn’t realize that he was committing plagiarhythm when he told his teacher that the composition was his own; although, in fact, he had put parts of melodies together from other songs he had found on the World Wide Web. 1. The unauthorized use or close imitation of the language and thoughts of another author and the representation of them as one's own original work: James was accused of committing plagiarism by his teacher, Mrs. Smith, because she had read the contents previously in a newspaper, which he claimed were all his own creation. 2. Etymology: from Latin, plaga, "a hunting net or snare used for capturing animals", then plagiarius was used to refer to "a literary thief". © ALL rights are reserved. If you steal from one author, it's plagiarism; if you steal from many authors, it's considered to be research. Wilson Mizner, an American sportsman and wit. 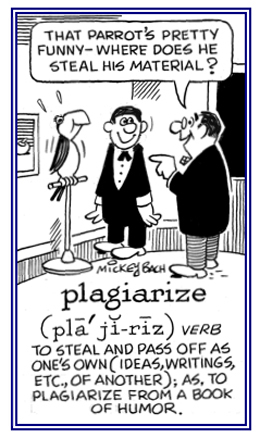 Someone who purloins or utilizes the words, writings, or ideas of another person, and passes them off to others as his or her own creations: A reporter was accused of being a plagiarist, or a literary thief, when he failed to give credit to the person who wrote the original report. Some musicians are plagiarists who take something composed by an old musical master and decompose it. A reference to copying the writing or ideas of someone else and passing it off as his or her own conceptions: The TV news moderator was accused of making plagiaristic commentaries about a politician which were written by another reporter in a newspaper the day before. 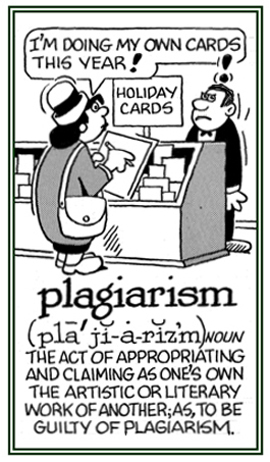 The act of taking and using another person's statements as if they were compiled by another individual who was repeating them as his or her own: The student's graduation speech to his fellow students obviously consisted of several plagiarizations which he claimed he had created while he was preparing his presentation. 1. To use and to pass off the ideas or writings of someone else claiming them as one's own: Many dictionaries seem to be plagiarizing the definitions of each other because so many of them have exactly the same contents and wording. 2. Etymology: from Latin plagium, "kidnapping" then it became "literally thief". © ALL rights are reserved. Someone who uses another person's ideas as a part of his or her work and pretends that it is the creation of the one who is doing the "borrowing" whether it is intentional or not: Jane accused a fellow student of being a plagiarizer because that person was using the same contents in his report that she had written after she had asked him if he would read her biological composition to see if there were any errors in it. A person who purloins another's expressions or ideas, and offers them as his or her own: There are those who consider plagiary something that is done by literary thieves. Adam was the only man who, when he said something good, knew that nobody else had ever said it before him and so he could not be accused of committing plagiary. —Compiled from a statement made by Mark Twain. Showing 1 page of 8 main-word entries or main-word-entry groups.